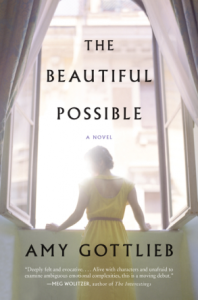 The Beautiful Possible (Harper Perennial, $15.99), by first-time novelist Amy Gottlieb, opens in Berlin, 1939, but quickly moves to New York City and Westchester County, New York, where most of the action will unfold. It traces the story of Rosalie Wachs, who is drawn to both Sol Kerem, who will become her studious rabbi husband, and to Walter Westhaus, who washes ashore smelling of the spice market in India to which he had escaped after his father and fiancée were killed by the Nazis. Ostensibly about the love triangle that develops among the three while Sol studies at Manhattan’s Jewish Theological Seminary — and lasts the rest of their lives — the novel is really a study of the restrictions that bind Rosalie and her struggle to loosen them. The two men get their narratives, but in truth they never amount to more than projections — or to use the mystical terms of the novel, emanations of her desires. On the one hand lie stability of family and adherence to a Jewish life, and, on the other, sexual passion and intellectual voraciousness. Rosalie is the real revelation here: fiercely intelligent but boxed in by the expectations of her time and place. The Beautiful Possible is always engaging, its story sure to resonate with many readers. Its greatest strengths lie in its ability to capture the essence of the religious life without any preciousness and its use the rabbinic device of she’elah and tshuvah — question and answer — in order to examine and attempt to resolve the tensions between Jewish law and the sometimes contradictory, often mysterious, workings of the human heart.